The RAIL/AmeriCorps partnership is a winning combination, resulting in completed community projects and AmeriCorps members learning a variety of marketable skills. “AmeriCorps is providing on the job training and community service that can help introduce new businesses into the coalfields,” according to Dewey Houck, president of RAIL. In a partnership with Citizens Conservation Corps West Virginia (CCCWV) and Corporation for National and Community Service, four AmeriCorps members are performing community service work in Wyoming County. The four AmeriCorps workers are assigned to RAIL and headquartered at the Mullens Opportunity Center. In addition to maintaining RAIL projects that include the MOC, Guyandotte River Park, assisting at the area food bank, and numerous other community enhancement projects, the AmeriCorps members are learning a trade and exploring opportunities based on local attributes, Houck explained. The team has removed the former steam heating system and is replacing it with an individual gas and electric heating system that will dramatically decrease the utilities cost at the Mullens Opportunity Center. The MOC building, the former Mullens Grade School facility, is now almost 70 years old and keeping the plumbing, heating, and electrical system operational is an almost daily task, Houck noted. “This kind of experience works well to prepare the team for starting a demolition and restoration business,” he said. With no budget for maintenance, the work is completed at the MOC by volunteers and staff. “That said, the entrepreneurial spirit is present and the AmeriCorps team continues to look at building business, based on the area’s natural resources, that will help build a new economic base,” Houck said. Currently, timber is being taken out of Wyoming County that can jump start an industry of processing logs into authentic 17th century log home kits, Houck noted. “The erected kits will be used to develop a cost/profit analyses and marketing program,” Houck said. “All important in the training is to have volunteers such as Gary Runion, Reece Neely, Bobby Davis, and others provide professional guidance and expertise necessary to keep the MOC operational while finding other ways to improve their community,” Houck emphasized. At this point, the AmeriCorps team is made up of Chris Hicks, Ariel Martin, Ian Halsey, and Chris Trent. The AmeriCorps term is six months with an option of serving an additional six months with approval of the sponsoring organization. AmeriCorps provides health insurance, a college education award of $2,907 after six months of service, as well as a living allowance of $490 on the first and 15th of each month. Anyone interested in an AmeriCorps position is urged to phone Charlene Cook, MOC director, at 304-294-6188. “RAIL is most proud to be affiliated with the AmeriCorps program and CCC WV,” Houck emphasized. Citizens Conservation Corps West Virginia has an allocation of 12 AmeriCorps members, with eight assigned to the Twin Branch Recreational Facility in McDowell County and four assigned to the MOC in Wyoming County. The Avalons, family-oriented entertainers who perform rock-n-roll oldies, will headline the second annual Mullens Spring Festival. Fallen Rock, a well-known Mullens area band, will be the featured performers Friday from 8 until 10 p.m. The Spring Festival is scheduled May 9-12, Wednesday-Saturday, featuring carnival rides, by Myers Amusements, on the former Ray Wells Preowned Auto property. Returning favorites include the Mullens Fire Department’s hot dog sale, Mullens Idol contest, Spaghetti Eating contest, among numerous popular activities, along with a variety of vendors. Concerts and other events will be held at the Mullens Opportunity Center (MOC), the former Mullens Grade School building, across from the carnival. The Avalons, formerly Sh-Boom of Ohio, are a nationally-known band that performs music from the 1950s, ‘60s and ‘70s along with comedic antics and audience participation. They will take the stage Saturday at 8 p.m. The Avalons have shared the stage with such well-known artists as the Beach Boys, America, Four Tops, Temptations, Smothers Brothers, Vogues, Mamas and Papas, among numerous other stars. Myers Amusements provided rides and other carnival activities for last year’s festival and, in previous years, for the Dogwood Festival, Dewey Houck, one of the organizers, explained. “The Spring Festival is a feature, orchestrated by the City of Mullens, that is designed to have something for every member of the family – young and old,” Houck emphasized. ❖ On Wednesday, vendors will set up at 9 a.m. along with registration for the E.B. And Janet Weaver Memorial Art and Photography contest, sponsored by BJW Printing, in the MOC gym. Divisions include kindergarten through fourth grade, fifth to eighth grades, and ninth grade to adult. There is a three-item limit. The fire department’s hot dog sale will begin at 5 p.m. in the MOC gym. Myers Amusements will be open from 6 until 10 p.m., with a $20 hand-stamp special. ❖ On Thursday, vendors will open at 10 a.m. along with E.B. And Janet Weaver Memorial Art and Photography contest registration in the MOC gym. The fire department’s hot dog sale will begin at noon in the MOC gym. Carnival rides will be open from 6 until 10 p.m., again with a $20 hand-stamp special. Registration for the Mullens Idol contest, sponsored by KISS FM, will be conducted from 6 until 7 p.m. Prizes will be awarded to first, second and third place winners. ❖ On Friday, vendors again open at 10 a.m. along with the E.B. And Janet Weaver Memorial Art and Photography contest registration. The fire department’s hot dog sale will begin at noon in the MOC gym. The Dogwood Tree Planting Memorial ceremony, sponsored by Tankersley Funeral Home, will be conducted at 4 p.m. on the MOC stage. Carnival rides will be open from 6 until 11 p.m., again with a $20 hand-stamp special. Fallen Rock will be the featured performers from 8 until 10 p.m.
❖ On Saturday, Sidewalk Chalk, sponsored by Butch McNeely’s State Farm Insurance, is scheduled from 9 a.m. until noon. Vendors will again open at 10 a.m. with judging for the art and photo contest. The Kids Cake Championship, sponsored by Christy’s Creative Confections, is scheduled at noon for 8- to 12-year-olds and 13- to 16-year-olds. Prizes will be awarded for first place and runners-up along with certificates of participation for all those entered. Myers Amusements rides will be open from 1 until 5 p.m. with a $20 hand-stamp special; then, re-open from 6 until 11 p.m. with a $20 hand-stamp special. The Spaghetti Eating contest, sponsored by Second Street Station, is scheduled at 2 p.m. in front of the MOC stage for children ages 6 to 9 and 10 to 13. A $50 prize will be awarded to the winner of each age category. Stoney Trent will perform as Elvis on stage at 4 p.m.
At 7 p.m., contest winners will be announced on stage. The festival will culminate with The Avalons at 8 p.m. on the MOC stage. Dewey Houck has worked hard all his life. Today, at the age of 82, he is still working, but now as a volunteer and community leader. After retiring from the railroad at the age of 55 in 1989, he went to work to give back to his beloved community. Today, nearly three decades later, he is president of the Rural Appalachian Improvement League (RAIL) which has built a very successful community center in the former Mullens Grade School building. Known as the Mullens Opportunity Center, or MOC, the center houses a variety of activities, and opportunities, for residents. I have a house in Roanoke, Va., that I share with my daughter. I am making my primary residence in Pierpont, in a house built especially for me by my friends. I also have a room at the MOC where I have lived since my wife died about a year ago. I have two children that I am very proud of. My son, who was born at the Mullens General Hospital in 1956, just retired from Boeing as a senior vice president. My daughter, born in Bluefield, is a medical doctor and Lieutenant Colonel in the U.S. Army Reserve. I graduated from Mullens High School in 1955 and married fellow classmate Sheila Snyder. We joined in marriage that same year and began attending Concord College. After a year and half at Concord, I took a job with the Virginian Railroad in Mullens that was much better suited to my upbringing and educational capacity. I was born in Pierpoint in 1934. We moved to Otsego, Mullens, Wyco, and then back to Pierpoint when I was in the fourth grade. I went through the eighth grade at Maben Grade school. Share a story that best typifies your childhood. Like many youth of my culture, I quit high school in the ninth grade. Going from a small school, such as Maben, where many of the teachers taught two classes in the same room, I was not properly prepared for high school. The high school teachers taught the brightest and those of us who could not keep up were quickly getting failing grades. Rather than being embarrassed, I took the easiest way out. I tried coal mining and truck driving, but pressure to get me back into high school, from my parents and other family, did not cease. The best thing that ever happened to me was going back to high school where I met Miss Sheila Snyder. The second try at high school presented no problems with grades, it was some of the best years of my life. I graduated the oldest in my class. Who, or what, has been the biggest influence in your life and why? My life began with a loving mother and father that were role models and taught me the value of family and community. My wife instilled in me that we are all God’s children and we must do good for all and not discriminate. My church (Presbyterian) taught me to witness by doing good for others. I was fortunate to take a job with the Virginian Railroad in 1957. My career, with the railroad, that I felt was honest and well managed, supported my modest family lifestyle and now retirement. All these influences shaped my life and prepared me to give back to the society that had given me a good life. How would you best describe your work ethic? I believe in, and practice doing, the best I can at whatever I attempt. You were retired from the railroad, then organized RAIL; is that right? I retired from the Norfolk Southern Railroad in Atlanta, Ga., in 1989 at the age of 55. The first 10 years of retirement were spent volunteering on projects that were meaningful, but had little effect on the society that had provided a good life for me and my family. My health was good and I had a modest pension that would allow me to return to my favorite place in the world to spend a couple years doing community service in Wyoming County. I have spent most of my time here ever since and I hope to spend as much of my remaining years as possible here. In April 2001, I went to a Mullens City Commission meeting and offered to volunteer to do whatever I could to help the city. They gave me a recently completed, high quality Community Design Team plan and supported efforts to build the Rural Appalachian Improvement League, Inc. (RAIL). The 2001 flood occurred before we could get the plan under way and I spent almost two years assisting with the flood cleanup. You now drive from Roanoke, Va., to Mullens, W.Va., almost daily to essentially volunteer through RAIL. Why have you decided to do that? When I first came back to Mullens, I lived with my brother Terry and his wife Bobbie during the week and returned to Roanoke for the weekend. My wife was not in good health and we decided to continue living in Roanoke because of better medical facilities. Since my wife’s death last August, I have spent almost all of my time in Mullens. I spent my 18th birthday working in a pony mine at Josephine, W.Va., earning $10 per day. My job was to derail runaway coal cars being pulled by a team of ponies to keep them from meeting head-on and killing or crippling each other. I returned to a mechanized coal mine at Itmann while in college, working on the track for one summer. Had it not been for a family member working on the railroad, who had the influence to get a job for me, I would probably have gone back into the mines. What did you hope to accomplish when you created RAIL? My initial interest in volunteering was to find ways to help improve life quality for families living in the coalfields, with a strong interest on environment. My interest was not to demonstrate, but to take what we had and treat our mine-scarred lands as a resource. One of my goals was to start a watershed association. With the efforts and guidance of RAIL AmeriCorps VISTA Kelly Jo Drey, a very successful and active watershed association (Upper Guyandotte Watershed Association) was founded as a non-profit corporation. When Kelly Jo left, UGWA floundered for several years and finally discontinued operation this year. RAIL did a study to bring Groundwork USA, a federal program similar to RAIL, to Wyoming County. Although Groundwork was well funded, I did not feel it fit the needs of Wyoming County. Additionally, Groundwork would have to replace RAIL. RAIL had made a good case to bring Groundwork to Wyoming County, but decided not give up its mission for Groundwork and abandoned its own efforts. Proponents at the federal and local level decided to take on the responsibility of establishing Groundwork in Wyoming County. Now Groundwork, UGWA, and a dozen or so other similar startups in Wyoming County have failed since the 2001 flood with little visibility of their efforts. After 16 years of service, RAIL is now more active than ever. I feel like we have gone beyond what I had hoped for when RAIL was created in 2001. Hopefully, what has been accomplished by RAIL will convince those that have resources to support its continued efforts. For me, it is most enjoyable to work with the wonderful and loyal staff and volunteers. Charlene Cook does a very good job managing the Mullens Opportunity Center (MOC) which was the former Mullens Grade School. Her assistants include Joey Ashley, Tim McGraw, and Brenda Tilley. The structures that surround the MOC would not be there without volunteer leader Gary Runion, who also is the first one that gets a call when the electricity or plumbing is malfunctioning. The RAIL/CCCWV AmeriCorps team – which includes Chris Hicks, Matt Sink, and Wyatt Smith – are all important to maintaining the RAIL facilities and building parks and recreation facilities along the Coal Heritage Trail. Ruby Ingram is doing an excellent job managing a garden startup program through a Berea College program. And it is always exciting to work with college spring and fall break teams. University of Kentucky and William and Mary will be visiting in October. Utilizing the 10,000 hours of volunteer service RAIL receives each year to build sustainable projects is very satisfying and educational for the staff. For the 2018 spring break, Baltimore University and Delaware University will be here in March. Baltimore has spent their spring break for the past three years establishing an orchard on a nearby abandoned mountain farm. A friend has provided RAIL a portable sawmill. A friend has agreed to provide RAIL logs sufficient to build a 17th century hand-hewed log cabin at the former mountain farm orchard. RAIL volunteers, staff, and AmeriCorps will bring all these resources together, with help from the spring break teams, and leave another tangible asset in Wyoming County. Not only do we have an authentic mountain hand-hewed cabin, but we are hopeful that one or more of the AmeriCorps will start a business of building and marketing hand-hewed mountain cabins. Building and marketing cabins meets one of RAIL’s goals of using local products in West Virginia to produce jobs. I firmly believe that people living in the coalfields must solve their social and economic problems. And the best place to start solving those problems is with the young people. Not much of this can be accomplished without sound management and the best leadership possible. What frustrates you, or maybe limits you, as president of RAIL? I will readily admit I am frustrated and disappointed that I am not able to accomplish as much as can be achieved based on available resources. I did not have the education, training, and had only limited energy and intellect which is essential to building a successful business. Perhaps attempting to start a new kind of business at the age of 67 limited my ability to do more. I firmly believe that if we had a professional person equipped with energy, creativity, intellect, and the desire to help build a new economic base in the coalfields, RAIL would be a much more successful and sustainable organization. Our local agencies are doing their job and can well use the versatility that a non-profit has to offer in helping build a new and prosperous social order. The fact that I take no compensation for my labor and work long hours has allowed RAIL to operate somewhat successfully for the past 16 years. At 82 years old, time, energy, intellect, and an old folk’s memory are taking a toll. I would like to have been and should have been gone from RAIL long ago, but finding someone that will work for nothing is difficult. Sadly, and probably with good reason, funders do not like to fund operating costs which includes people, utilities, and other costs associated with running a business. Not much can happen without a business and I feel like our limited staff and volunteers have built a business worthy of support from agencies and foundations. So I am frustrated that I cannot compete with other entities that have highly trained and educated grant writers. How big a difference do you believe RAIL has made for Mullens? I feel like RAIL has had a positive effect on Mullens. On a national, state, and local level, RAIL is small. Those of us that put our sweat and best efforts into building and maintaining RAIL programs and projects feel our results are effective. Perhaps giving a synopsis of RAIL’s accomplishments in Mullens is in order. A good place to start is with salvaging and taking ownership of the former Mullens Grade School Complex, now called Mullens Opportunity Center (MOC). The facilities are open to the public and used extensively as a community center. A healthy lifestyle and diabetes prevention and support are offered to the public as a service. Volunteers have constructed a mini museum/information center patterned after a Virginian outlying telegraph office, concrete handicap access to river, high tunnel, garden complex, and outdoor theater. Inside the MOC is a railroad museum, excellent fitness center, computer center, gym, two kitchens, and 22 rooms available for a host of uses. Do you believe you can make a difference in Wyoming County through RAIL? How? Yes, I think RAIL can help make a positive difference in Wyoming County – socially and economically. Thanks to CCC WV, RAIL has an AmeriCorps program that not only is a powerful workforce, but it is preparing our young people to become leaders and assist them in starting businesses. Thanks to the generosity of Pocahontas Land, RAIL now owns the former Itmann Grade School and has established a well-used roadside park along the Coal Heritage Trail. The mission of RAIL is to help improve life quality for all families in the coalfields, focusing on Wyoming County needs and opportunities. I would like to emphasize RAIL can only help solve the problems that exist in the coalfields. It takes us all working together to build a new and sustainable economic base. You’ve been a proponent of saving the historic buildings in Mullens. Why? And, have you been successful in that? I feel we need to save historic buildings to preserve their history and also to give local citizens a sense of pride in their community. It is hard to feel good about your location when you are surrounded by decaying buildings. In addition, the restoration provides needed jobs and is an excellent opportunity to teach our youth marketable skills. What do you believe are the attributes of a successful leader? How do you incorporate these attributes as president of RAIL? Leaders must have capacity to see positive possibilities where others see only negativity. Then leaders turn their dreams into workable plans. They find ways to share their plans that entice, and welcome, others to become involved in implementing the plans. As RAIL president, I devote hours assessing needs and possibilities; then I work to pair each volunteer, and each employee, with the task for which they are best suited. How do you want to be remembered after you’ve left RAIL? If I am remembered as a man who cared for people, and the environment, and then put that caring into action to work for a better world, then I would feel my life was meaningful. I think of RAIL as people coming together to improve life quality for all families living in the southern coalfields of West Virginia. Without these people that have worked hard to better conditions in the coalfields, I would have nothing to write about. Staff photos by Mary Catherine Brooks (2)Boy Scouts working in New Richmond Tuesday morning unearthed a large wooden box containing numerous items, including tarnished metals, colorful beads, campaign buttons from the early 1900s, old coins and paper money, among other items. A faded letter said the bounty belonged to the finders. NEW RICHMOND — While Boy Scout Troops from across the nation have participated in community service projects across southern West Virginia, it was a West Virginia Troop that uncovered what appeared to be buried treasure Tuesday morning in Wyoming County. Thirty-one Boy Scouts from the Huntington area, along with two more Scouts from Colorado, unearthed a large wooden box while constructing a foot bridge in Guyandotte Park, near Wyoming County East High School. “We’re rich! We’re rich!” the Scouts chanted as four boys pulled their discovery from the ground. Wrapped in a deteriorating cloth, there was a key to unlock the large weathered box. However, in the excitement and with Scouts pushing in to get a closer look, the key was lost in the dirt. The lock was broken with the nearby digging tools to reveal pearls, colorful beads, jewelry, tarnishing metals, campaign buttons from the early 1900s, along with old coins and paper money. Afterward, pandemonium ensued with Scouts and local volunteers wanting to get a closer look at the discovery. With one Scout commanding all the items be placed back onto a rug where the new found wealth was laid out, the onlookers were much too curious to follow the instructions. Some of the Scouts, however, doubted the authenticity of the discovery, wondering about the age of the items included in the weathered box and the gluey remains of a vanished sticker on the bottom of a small statue. A faded letter instructed the “finders to keep” the treasure and Dewey Houck, president of Rural Appalachian Improvement League (RAIL), said as far as he is concerned, that is exactly what will happen. “The letter said it belonged to the finders,” Houck said. As to who buried the treasure, or when it was placed in the ground, or from where the loot could have come may be a mystery that is never solved. Under the direction of Houck and the RAIL staff, the Scouts were making improvements to the small roadside park on the Guyandotte, including new signage, improved walking paths, a river access point and a new foot bridge. Much of the work on the park thus far has been completed with college students who participated in service projects during their spring breaks. The park is one of several tourism projects Houck is coordinating to lure more visitors to the area. The Rural Appalachian Improvement League (RAIL) has selected the Guyandotte River Park to hold a news conference on July 25 at 10:00 AM to demonstrate what can be accomplished and what it takes to get the best benefits from the Boy Scout community service initiative. RAIL, that operates out of Mullens, WV, will be constructing two walk bridges, a sign for the park, a boat ramp for launching small river craft, and a PVC raft that will be used to clean up trash and fallen trees along the river. This public park, owned and operated by RAIL, is situated on the Coal Heritage Trail (Route 16) between Wyoming East High School and New Richmond. David Sebastiao, of Baltimore University, will be videoing the scouts’ work as an integral part of his documentary of the RAIL Guyandotte River projects. Although RAIL is spearheading four days of Boy Scout initiatives it would not be possible without wide cooperation and support from other agencies. Coal Heritage Highway Authority provided funding for the river project; Wyoming County EDA provided the guidance and connection to CCC WV essential to being awarded a day of Boy Scout community service. CCC WV also provided materials and, more importantly, is sponsoring an AmeriCorps team to RAIL without which these and other community enhancements would not be possible. WV DOH improved access to the site; Lowe’s of Beckley and Princeton donated materials and gave special attention to providing other materials that were purchased. Gary Runion and other local volunteers have spent many hours getting materials ready for the days of building. The Boy Scout community service initiative gives those living in southern West Virginia an opportunity to come together and demonstrate their strength in taking steps to build a new economic base. All are invited to celebrate the Boy Scouts’ community service at a music program at the Mullens Opportunity Center, Tuesday, July 25, beginning at 8:00 PM. The evening’s entertainment is Provided by RAIL. Come and enjoy Buddy Allen and the Cheat River Band. Rural Appalachian Improvement League (RAIL) is working to develop the area tourism industry, based on the region’s culture and heritage and naturally occurring attributes, according to Dewey Houck, RAIL president. “RAIL is working on ways to transform mine-scarred lands into community assets such as parks and recreational facilities, mountain biking trails, and assuring the Great Eastern Trail is routed through the coalfields,” Houck explained. “Geographically, the area RAIL serves is located within 500 miles of 60 percent of the U.S. population and has great potential to prosper as a tourism destination,” he said. “A new four-lane highway will soon connect Mullens to Interstates 64 and 77 by a 20-minute drive. “The Coal Heritage Trail, the Guyandotte River Water Trail, the Hatfield-McCoy Trail, and the planned Great Eastern Trail pass through the Mullens’ city limits,” Houck said. At this point, however, Mullens is receiving few benefits from the projects, Houck said. “RAIL has invested thousands of volunteer hours into making the area more tourism friendly,” Houck emphasized. “It now needs to develop a professionally-managed, comprehensive plan and pull together a dedicated labor force to reach the full potential of the benefits of a tourism economy,” Houck noted. The Rural Appalachian Improvement League staff and dozens of volunteers have breathed new life into the former Mullens Grade School building which sits on the banks of the Guyandotte River. The center features camp sites for travelers and ATV riders, picnicking and fishing along the river, a coal/railroad museum, as well as both indoor and outdoor stages for concerts and other community events. “The MOC is home for a fall and spring festival as well as many functions that bring people together,” Houck said. The Mullens Opportunity Center, known locally as the MOC, now houses a variety of projects – from agriculture, to health and wellness, to tourism. In addition to amenities for tourists, the three-acre parcel is home to a vibrant community center that also offers healthy living classes, a safe place to exercise, youth development programs, space for small businesses, agriculture programs that include community gardens and a seasonal farmer’s market. Currently, RAIL does not have sufficient management capacity to fully utilize the amenities to produce a profit, Houck said. Through a partnership with the state Citizens Conservation Corps and the Corporation for National and Community Service, RAIL has six new CCC AmeriCorps members, including, standing from second left, Kody Lester, Jacob Stewart, Matt Wilcox, Wyatt Smith along with, in front, Meredith Helmick and Whitney Mitchell. Also pictured are Joey Ashley, standing left, of the National Council on Aging, formerly Experience Works; Dorothy Horne, standing far right, of CCC, and Charlene Cook, of RAIL. Rural Appalachian Improvement League (RAIL) is combining the talents of area youth with those who are more mature in an effort to improve the community. Through a partnership with the state Citizens Conservation Corps and Corporation for National and Community Service, RAIL has six AmeriCorps members who recently joined the program. Four positions through the National Council on Aging, formerly known as Experience Works, are also providing assistance for RAIL at no cost. “Our goal is to train, prepare and assist this group in helping to build a new, improved social order and economic base in the coalfields,” Dewey Houck, RAIL president, said of the CCC AmeriCorps program. “What we are attempting to do is take resources that are readily available, or at little cost, and use these resources wisely to help work our way out of poverty,” Houck said. The program involving the youth is called West Virginia Coalfield Communities Conservation Corps and will be modeled along the same lines as the CCC program of the Great Depression era, Houck explained. The federal program provides the youth a monthly living allowance and a $5,815 education scholarship following one year of service, he added. Program participants include Matt Wilcox of Mullens, Kody Lester of Herndon, Whitney Mitchell of Indian Creek, along with Meredith Helmick, Jacob Stewart and Wyatt Smith, all of Pineville. The high school graduates all indicated they want to stay in Wyoming County, Houck said, thus the program works to provide them the job skills to do that. “A significant emphasis will be placed on utilizing their labor for developing business on lands damaged by coal mining and related industries,” Houck said. Under the direction of Dorothy Horne, of CCC, which is part of Volunteer West Virginia, the Wyoming County participants are working in conjunction with those at the Twin Branch Adventure Facility in McDowell County. As part of the education elements, the youth will be concentrating on environmental skills that include erosion control, wetlands, vegetation and stream banks. Additionally, individualized training geared toward each participant’s interests will be integrated into his/her training. Along with educational components of the program, the participants will be doing physical labor such as building community gardens, constructing trails, wild life enhancement projects, working with school gardening programs, and with the Mullens Opportunity Center’s agriculture projects. “A portion of their labor will be dedicated to learning opportunities, such as specialized farming, building high tunnel greenhouses and producing specialty family farm products to include nuts, chestnuts, berries, mushrooms, poultry, beef, pork, and fish,” Houck said. Horne said the group will also be assisting with special community events such concerts, craft shows, among others. She noted the participants will be “job ready” when they complete the highly structured program. Participating in the program will also build their confidence, Horne said. “When they leave (the program), they know they can do whatever they need to do,” she emphasized. The program goal is to help participants create at least three new businesses that will employ others, Houck said. More than $72,000 in payroll benefits will be generated in Wyoming County due to the program, Houck emphasized, along with nearly $35,000 in scholarships. One of several programs now under way at the Mullens Opportunity Center, also known as the MOC, is a farming program available to 25 families in Wyoming County. Families are being recruited now and those interested are urged to contact the MOC. Developing specialty agricultural and energy programs is another way to help support families in the Appalachian coalfields, emphasized Dewey Houck, director of Rural Appalachian Improvement League (RAIL) in Mullens. The RAIL program is housed in the MOC. “Berea College has just awarded RAIL a grant to assist 25 families with starting a vegetable garden,” Houck noted. Assistance will be provided with plowing and planting, RAIL will also provide the seeds and tools, Houck said. The gardens can be planted in whatever location the family wants, he added. Additionally, participants will also be instructed on how to “can” their harvest. “This is a pretty nifty program,” Houck emphasized. For families that are interested, RAIL can also provide a high tunnel greenhouse at a reduced cost. Ruby Ingram, who has managed the Farm to School program for RAIL, will manage the project. “With the demise of the coal business economy, families must turn to other vocations to earn a livelihood if they desire to remain in coal country,” Houck said. “For the past four years, RAIL has worked diligently to establish an agricultural program by managing a Farmers Market that accepts SNAP benefits in addition to establishing a Farmers CO-OP,” Houck said. A $7,250 grant from WVU Appalachian Foodshed paid for an AmeriCorps VISTA member to help build the MOC into a model farming project. Duquesne University donated $2,400 and a $1,000 fundraiser paid for a high tunnel, a watering system, tool house, and composting bin. “The system is a small scale farming operation that can demonstrate the economic value as well as health benefits for local families,” Houck explained. RAIL acquired its high tunnel from Grow Appalachia, a program at Berea College that fabricates high tunnels. RAIL is now working with David Cook at Grow Appalachia, a subsidiary of Berea College, to fabricate and assemble components at its Commerce Center in Itmann. “RAIL looks at high tunnels and greenhouses as a potentially lucrative business on mine-scarred lands, mountaintop removal sites, and old abandoned mountain farms,” Houck said. “RAIL has reestablished an orchard on a former mountain farm that will provide fruit for all the local schools and those of need. “The property has a gas well and high energy electric lines within sight. “The property has a series of gas wells, and coal mining cleanup and AML sites within a four-mile radius. “The area is very conducive to building solar farms and highly efficient gas-powered electricity turbine generators. “The operation envisioned by RAIL would grow fresh vegetables year-round and produce surplus electricity for the grid. “Most properties involved are owned by the Norfolk Southern Railway, who has been very supportive of RAIL programs. Norfolk Southern can provide rail service to transport heavy articles, such as gas turbines, that can provide enough electricity for the greenhouses and the entire county at 60 to 70 percent efficiency when supplemented by solar,” Houck noted. “One site in the area would probably support a wind turbine. Houck said, in 2015, UMW President Cecil Roberts called for the state Legislature to take advantage of a 1985 law that allows a state agency to issue public bonds to construct new power plants, using a public-private partnership. The Mullens Opportunity Center is located at 300 Front Street in Mullens, in the former Mullens Grade School building. For more information, phone 304-294-6188. Butch McNeely, in orange shirt, State Farm agent in Mullens, assisted young adults in the garden at the Mullens Opportunity Center. McNeely arranged a $5,000 grant through State Farm to support the agriculture programs at the center. Beginning in late June, the Mullens Opportunity Center staff will again offer free space for those who wish to sell their fresh produce this summer during their farmers market. Charlene Cook, director of operations at the Mullens Opportunity Center (MOC), and Ruby Ingram, Farm To School coordinator, have peas in the garden and half-runners in the high tunnel greenhouse to help boost the fresh produce that will be offered to those that support the farmers market at the center. All who have a garden and wish to earn a little extra cash are urged to bring their extra produce to the MOC farmers market and offer it for sale. “There is no fee to sell at the market and good produce goes quickly,” said Dewey Houck, director of Rural Appalachian Improvement League (RAIL). “The MOC hopes to provide produce through the SNAP program again this year,” Houck noted. “Only those that sell their own produce and other goods will be welcome to sell their goods at the gardeners’ market,” he emphasized. The free services and opportunities offered at the MOC are funded through many sources and volunteers, Houck explained. Most importantly is Wyoming County Board of Education which provides the facility, Houck said. The young adult labor is provided through a ROSS IES youth program which is funded through Region 1 Workforce. Experience Works also provides labor through an older adult training program, Houck said. Additionally, two AmeriCorps positions are provided through CCC West Virginia. “RAIL must pay a fee for one AmeriCorps State and one AmeriCorps VISTA,” Houck noted. Additionally, Butch McNeely, RAIL charter member and State Farm agent in Mullens, coordinated a $5,000 State Farm grant to assist with funding the Young Adult program at the center. McNeely has supported the Mullens Opportunity Center since it opened in 2002, Houck said. Tim McGraw, right, and University of Kentucky volunteers identify and document African American graves from World War II in the “Lost Cemetery of Mullens.” The house in the background is where Nuriva coal tipple once stood, according to officials. Several University of Kentucky students spent a weekend cleaning up and identifying grave sites in the “Lost Cemetery of Mullens,” along with local volunteers and staff from the Mullens Opportunity Center. “Perched on a hillside across Slab Fork creek from the former coal camp of Nuriva, the cemetery is now a part of the city of Mullens,” explained Dewey Houck, Rural Appalachian Improvement League (RAIL) director. The RAIL Culture and Heritage Team is currently researching graves in the cemetery, Houck said. During a recent visit, team members discovered the graves of three African American veterans from World War II. “In addition, several unmarked graves were uncovered, buried under fallen leaves, branches and other debris. “Some believe the Chinese workers, who died from the Caloric tunnel collapse while the Virginian Railway was being constructed, are also buried in the cemetery,” Houck said. “Weirton committed more than 4,000 hours of volunteer service this past year,” he said. “Wyoming County volunteers committed over 2,000 hours planning, supervising, and assisting the volunteers,” Houck noted. “University spring break teams account for about half of RAIL volunteer efforts,” Houck said. These community projects are possible due to support from Wyoming County Schools, which provides the MOC facilities to host volunteers during their stays, according to Houck. “Volunteer hours are completely dedicated to projects that enhance the community. In September, more than 50 people participated in a cleanup project at the historic Itmann Company Store building. In addition, the Guyandotte River Park was cleaned up and a boat ramp was installed with the help of Wyoming County East High School students. “A trail was also built along Milam Creek, and building repairs and other projects were completed, all helping to make Wyoming County a better place to live and attract businesses,” Houck said. Five spring break teams are booked for the 2016 season, which begins the last week in February and ends the last week of March. “RAIL is considering an AmeriCorps NCCC team that would arrive in May, with a team of 10 and stay for six to 10 weeks. “Since 2000, RAIL has averaged over 10,000 (volunteer) hours per year and looks to exceed the average in 2015 and 2016,” Houck emphasized. Elron University students hauled load after load of clothing and other debris from the Itmann Company Store to dumpsters Tuesday as part of the statewide Day to Serve observance. Area volunteers, bottom photo, armed with chainsaws, weed-eaters and brush hogs chewed through the brush and weeds overtaking the Itmann Company Store building Tuesday. The massive cleanup project was spearheaded by Rural Appalachian Improvement League (RAIL). ITMANN – Area volunteers and a team of students and advisors from Elon University, in North Carolina, worked to clean up the iconic Itmann Company Store building, as well as begin construction of a “boat ramp” at the Guyandotte River Park, Tuesday, part of the statewide Day to Serve observance. Once a picturesque testament to the early 20th century coal boom, the crumbling Itmann structure had become a community eyesore. Over the last few years, the historic facility has been seriously damaged by vandals, looted by thieves, overshadowed by thick brush and tall weeds, with portions used as a dump for tons of old clothing and other trash. ”This may be the most important project we’ve ever done,” emphasized Dewey Houck, executive director of Rural Appalachian Improvement League (RAIL). While men armed with chainsaws, weed-eaters and brush hogs chewed at the outside overgrowth, the students hauled load after load of clothing and other trash from the building to dumpsters provided by the state Department of Environmental Protection and the Wyoming County Commission. Houck said the property would be boarded up, at least temporarily, to secure the building and keep vandals from further destroying the facility until a plan could be devised to make the property a viable part of the community again. In cooperation with Billy Wayne Bailey, property owner, “the cleanup comes at a time when RAIL is working with local youth to assist with other community projects,” Houck said. “We hope to get our youth program in operation later this fall,” Houck added. “That will provide a work team to keep the property clean and secure until a plan is developed to find the best use for it. “We must all pull together to assure it’s not lost to decay. Designed by Bluefield architect Alexander Mahood, the gigantic facility was constructed by Italian stonemasons in the mid 1920s. It housed the Pocahontas Fuel Company offices and store, as well as the post office, doctor’s office, among other services. The town was named after company president, Issac T. Mann. The mine and company store closed in the 1980s, and the structure was placed on the National Register of Historic Places in 1990. The 15 Elon University students, along with two advisors, were divided between cleaning up the Itmann property and assisting with the beginning phase of the Guyandotte River Park boat ramp. The students are part of the university’s Gap Program, according to Elizabeth Coder, program coordinator. The college freshman will not begin traditional campus courses until the next semester begins in January. This semester, the students are being trained in leadership, environmental science and outdoor living skills. Thus far, they have participated in a 25-day, 75-mile backpack hike through the Wind River Mountain Range in Wyoming, service projects in Pine Ridge Indian Reservation, S.D., and St. Louis, Mo., and will spend six weeks in Costa Rica before their semester ends. “This is just the first phase,” explained Maria Dimengo, of RAIL, as volunteers cleared a path to the Guyandotte River from the small roadside park, near Wyoming County East High School. When completed, park visitors may launch a small water craft from the ramp. It is an effort to make the park and the river more “water craft friendly,” she said. Additionally, the volunteers completed maintenance on the walking paths and picnic area in the park. A high tunnel greenhouse, pictured right, and gardens at the Mullens Opportunity Center can easily provide a large portion of food necessary to feed a large family, according to Dewey Houck, RAIL director. The MOC gardening practices are providing produce for the weekly farmers’ market. Pictured are Tim McGraw, left, and Ruby Ingram at the MOC garden complex which will produce fresh vegetables April-November. For more information or assistance in obtaining a high tunnel greenhouse at little or no cost, Houck is urging residents to phone the MOC at 304-294-6188. Agricultural programs in Wyoming County are moving forward, including a Farm To School project and a farmers’ market, according to Dewey Houck, Rural Appalachian Improvement League (RAIL) director. “Projects being implemented in 2015 are paving the way to establish agriculture as a new business in the southern West Virginia coalfields,” Houck said. “A lot of people are involved in the process and I feel like we can help bring gardening back as a way of life in the coalfields,” Houck said. “Since Secretary of Agriculture Walt Helmick visited Wyoming County in January, much has transpired to promote agriculture in the coalfields,” Houck noted. Helmick discussed the benefits of high tunnel greenhouses, and other agricultural practices, with area farmers at the Mullens Opportunity Center (MOC). Ruby Ingram, an AmeriCorps member sponsored by the West Virginia Department of Education, established a Farm to School Program in the county. Through the program, raised beds and other gardening practices were established at Herndon Consolidated Elementary and Middle, Mullens Middle and Mullens Elementary schools, Houck said. The goal is for students to grow fresh vegetables for their school meals. Lowe’s in Beckley provided lumber at no cost for the raised beds. Also making contributions to the Farm to School program were Second Street Station, Tankersly Funeral Home, First Peoples Bank, Wyoming County Board of Education, First Community Bank, Leah Brewer and Charlene Cook. Area businesses also provided additional resources, Houck said. “The Farm to School Program will eventually connect farmers to schools so that local produce can be sold directly to the school,” Houck explained. West Virginia University, through the Appalachian Foodshed Project, provided seed funding for a farmers’ market in Mullens. The market has been conducted each Thursday at the MOC through the summer. The Appalachian Foodshed Project is a program that assists West Virginia, Virginia and Kentucky in expanding farming projects. Only local products can be sold at the farmers’ market, which will continue until the end of September. Some vegetables from the MOC high tunnel greenhouse and fall crops will be sold as they become available later in the season. Building a Farmers CO-OP is in the planning process in an effort to sell vegetables and fruits to the public and to the school system next year, he said. Charlene Cook, along with Experience Works and ROSS IES workforces, have been able to use the MOC high tunnel greenhouse and gardens to provide an abundance of fresh vegetables to help get the farmers’ market established in Mullens, Houck said. Local vendors as well as farmers from McDowell County are also selling their vegetables at the MOC market. “The farming program would not have been possible without the help and momentum that came about through local volunteers and spring break teams from Ohio State, Baltimore University, Northwestern, Christopher Newport, and Duquesne,” Houck emphasized. The volunteer effort, led by Gary Runion, provided more than 3,000 hours building the high tunnel complex. Shirley Weaver, RAIL board member, spearheaded a fundraiser in her Florida hometown and raised $2,000. Duquesne University participants coordinated a fundraiser that raised $2,400 to help jumpstart the agricultural program at the MOC, Houck noted. “Although the mountainous area does not have large level parcels, there is more than enough space to feed the local population with plenty left over to market elsewhere,” Houck said. “There is a demand for agricultural products that need little land and low investment to produce fruit, berries, nuts, mushrooms, honey, ginseng, pork, venison, goat and fish. “By bringing together available resources and by applying human perseverance, farming can once again help support the livelihood of families in Appalachia. “Once established, a high tunnel greenhouse and garden the size of the MOC complex can easily provide a large portion of food necessary to feed a large family,” he said. The MOC garden complex includes a high tunnel greenhouse, vegetable garden, tool shed, watering system and compost bin that will produce fresh vegetables April through November. “Through a USDA program, Wyoming County families are eligible to receive a high tunnel greenhouse at no cost or little cost,” Houck emphasized. A high tunnel greenhouse can cost up to $10,000, Houck said. For more information or assistance in obtaining a high tunnel greenhouse, Houck is urging residents to phone the MOC at 304-294-6188. MULLENS — They came for hope — some with questions, some with myriad paperwork to claim federal black lung benefits, some pulling oxygen machines to help them breathe due to the debilitating lung disease. The miners attending a meeting Friday in the Mullens Opportunity Center wanted to know that benefits they’d been promised would be delivered. U.S. Rep. Nick Rahall, D-W.Va., met with Wyoming County coal miners to discuss the changes in the laws regarding black lung benefits and the efforts under way now in Congress to overturn recent gains in the legislation. Also talking with miners were Dennis Robertson, of the Bluestone Health Association; Joe Massey, president of the Fayette County and the National Black Lung Association; and Nancy Massey, who serves as secretary of the national organization; along with Sam Petsonk and Brenda Ellis, of the Wyoming County Black Lung Association. Nancy Massey said her husband, Joe, deals with black lung health issues and uses oxygen. “It’s no fun, when you’re trying to sleep,” she said, and you can hear your husband trying to breathe. “And it doesn’t get any better. It just gets worse,” she said. “The loss of a loved one to this debilitating disease is hard enough without having to jump through bureaucratic hoops,” Rahall told the group. For several years, Rahall said he had introduced legislation to overturn Reagan-era changes to the black lung program. Those changes resulted in longtime and sick coal miners having to overcome new legal hurdles to claim their benefits, usually fighting against an array of lawyers. Rahall’s legislation, which U.S. Sen. Robert C. Byrd sponsored as an amendment to the new health care law in 2010, partially repealed those Reagan-era changes, and also made it easier for miners’ widows to claim benefits. Byrd, in the final days of his life and in failing health himself, took the Senate floor to have language included in the Affordable Health Care Act that deemed any coal miner who has worked for 15 years in mining has the presumption of black lung disease, Rahall said. Since that 2010 change in legislation, about 1,700 claims have been processed with more than 1,000 claims for surviving widows. “There is a callous — and, let’s be honest, partisan — effort under way to undercut the programs designed to help treat the crippling effects of this terrible illness,” Rahall said. “It may be that (the process) is so long and drawn out because, maybe, the coal miners won’t be with us to collect the benefits,” Rahall told the group. “The too often callous treatment extended toward miners and surviving family members because of these burdensome requirements is being remedied, and I am so proud to have worked closely with Sen. Byrd to have helped make that happen,” Rahall said. On average, Rahall said, it takes 42 months to process a claim for black lung benefits due to the backlog. He’s made suggestions that he believes will reduce that time to 34 months. Dewey Houck, director of the Rural Appalachian Improvement League, along with Robertson and other panel members lauded Rahall’s continuing efforts to support coal miners. An AmeriCorps NCCC six-member team from Vicksburg, Miss., is spending 10 weeks in Mullens through the Rural Appalachian Improvement League (RAIL). 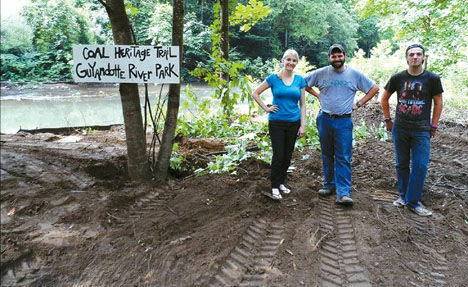 On Friday, the team, along with local volunteers, will work at the Guyandotte River Park, located near Wyoming County East High School and part of the Coal Heritage Trail, according to Dewey Houck, RAIL director. The team will also assist with Wyco Church restoration efforts, a Friends of Milam Creek plan and Mullens Opportunity Center tourism enhancement projects. Ages 18-24, the group will be housed in the MOC, Houck said, and contribute more than 2,400 volunteer hours at no cost to the community, with the exception of their lodging. AmeriCorps NCCC is a federal program similar to the Citizens Conservation Corps of the 1930s. Sponsoring organizations, such as RAIL, must provide sleeping and cooking accommodations as well as community service projects, Houck noted. Sponsors must also provide a detailed grant application and concise project schedule. Team members provide their own transportation, purchase their food and cook their own meals, Houck said. “The Mullens Opportunity Center has facilities for teams such as NCCC, and MOC staff and volunteers are excellent hosts for out-of-town work crews,” Houck emphasized. “The NCCC team visit to Mullens is made possible by volunteers that make up RAIL that will orchestrate over 15,000 hours of volunteer service dedicated to community and economic development in southern West Virginia in 2014,” Houck said. Last year, three NCCC teams assisted with Boy Scout Community Service Initiative projects at the MOC, Houck said. Prior to 2013, six teams helped with flood cleanup, building the Tater Hill picnic pavilion, and constructing the MOC’s outdoor stage and Jack Feller Information Center. Free garden spaces are being made available to physically-challenged individuals at the Mullens Opportunity Center, in conjunction with the Rural Appalachian Improvement League (RAIL), on a first-come, first-serve basis. Only a limited number of the small garden spots are available to those with such disabilities as arthritis, respiratory illnesses, among other physical limitations. Ergonomic tools will also be available for the physically-challenged gardeners, according to Charlene Cook, project director. Over the past few years, RAIL has sponsored multiple community gardens at the center, Cook said. “This year, we are making an extra effort to support physically-challenged persons,” she noted. “You may have COPD, or other chronic illnesses, and would like to plant a garden. We welcome you to the MOC.” Cook, with the Wyoming County Diabetes Coalition Healthy Lifestyle Program, and Faron Lucas, Experience Works, will co-direct the project. “We have raised beds and regular gardening spaces available with concrete walkway accessibility to accommodate gardeners with physical limitations,” she noted. The mission of RAIL is to improve life quality for families living in the coalfields and the Healthy Lifestyle program is an important component in that pursuit, Cook said. “RAIL is managed by the people and for the residents in the coalfields, and we look to those that have a need to participate in the process. “Dealing with those who are plagued with arthritis would be a new specialized target, but we feel a good place to help bring comfort to those who suffer with joint pain,” she said. For more information or to reserve a space, phone 304-294-6188. NEW RICHMOND — Work on a new roadside park, between Mullens and Pineville, is well under way, according to Dewey Houck, director of Rural Appalachian Improvement League (RAIL). Creating the Guyandotte River Roadside Park/Outdoor Educational Center began in July as part of the Boy Scouts’ community service projects. With fires blazing and the sounds of tools shattering the riverside oasis, a team of students and staff from Butler University, in Indianapolis, Ind., completed three days of work, Oct. 17-19, clearing a picnic area and a walking trail that loops the park, Houck said. With the help of local volunteers, the students cut brush and trees, removed trash, constructed steps along the trail and placed picnic tables. The three-acre site, leased from Pocahontas Land, will be an engaging stop for travelers along the Coal Heritage Trail, Houck believes. “People traveling need a place to stop,” Houck noted. “This is such a beautiful spot; it’s a wonderful roadside park. “It’s just off the highway. “Everything will be handicap-accessible. “You will be able to put a canoe in the river here,” he added. “You’ll be able to watch the train from here. The train will be something that makes the park unique.” The picnic area sits atop a knoll overlooking the trail, the Guyandotte River as well as W. Va. 10/16. Additionally, Houck wants to create an outdoor classroom for students. Wyoming County East High School sits only half-a-mile away. “It would be an easy walk from the school,” Houck noted. He said students could conduct water testing, explore aquatic life, and study the environment. “Can you imagine a student who wouldn’t rather be here than the classroom?” asked Ann Pauley, of Harrisburg. Pauley is one of several retired professionals who serve as RAIL volunteers. She has written grants and completed other projects, Houck said. Thus far, Houck has completed work on the new park with volunteer labor, including Gary Runion and Wayne Compton, both of Mullens. “They do all kinds of work for RAIL,” Houck explained. Darren Lusk will soon move in equipment to level the parking area. “We couldn’t do any of this without our volunteers,” Houck emphasized. The only cost will be $2,000 for guardrails, he said. The Butler students spent one entire day working in the rain, Pauley said. “They were wet and muddy; I didn’t hear any complaining,” she said. “We are thrilled to be in your community,” said Rachel Hahn, one of the student volunteers. “It’s been a joy. We hope everyone comes out to enjoy the Guyandotte River Park.” “It’s exciting to see the trail finished,” added Josh Etchberger, also one of the students. The students spent their fall break completing the work, staying in the Mullens Opportunity Center. Alex Petersen, also one of the student volunteers, has spent his last three autumn breaks doing volunteer work at similar locations. He said the students take such community service projects very seriously. “It’s one of the most powerful experiences,” Petersen emphasized. MULLENS —Moving in tandem, Boy Scout Troop D207, of California, worked alongside an AmeriCorps National Civilian Community Corps (NCCC) team at the Mullens Opportunity Center Tuesday. The Scouts were building picnic tables that will be placed at the campsites, and the picnic areas, behind the center. While the NCCC members assisted with the picnic table project, they also wheeled wheelbarrows of cement to complete a 120-foot handicap ramp that will allow visitors access to the Guyandotte River, which flows behind what was once the grade school building in Mullens. Visitors with physical limitations may use their wheelchairs to fish, to picnic, or just sit by the water, according to Dewey Houck, director of Rural Appalachian Improvement League (RAIL). The complete campground project has been in the making for nearly two years and now boasts 10 sites with electricity, water, and sewage services, Houck said. Three primitive camp sites will sit on the banks of the river, he said. Additionally, the new ramp provides easy access to the Guyandotte and a hiking trail is also under construction. Nearly 200 Scouts have participated and signed the “RAIL board,” with every state represented on the board. “Everybody that works on this project signs the board,” Houck emphasized. He also noted that AmeriCorps NCCC teams from years past have signed the various projects that have added to the numerous services offered at the MOC, including the outdoor stage for community events and the museum exhibiting the area’s coal and rail history. Additionally, the Scouts worked to create river access on state Rt. 10, between Mullens and Pineville, on a three-acre roadside park that will be developed by RAIL, Houck noted. Houck lauded his volunteers, most notably Gary Runion, who designed all the projects at the center and supervised construction. He also complimented Charlene Cook, who works with all the teams, the volunteers, and mans the center daily. “We’ve got about 35 volunteers and they all do a fantastic job,” Houck emphasized. Houck said none of the projects would have been possible without the assistance of the AmeriCorps teams and volunteers. “There’s no way we would have finished these projects without the help of the Scouts,” he said. It’s midmorning, and a group of volunteers pauses its vacuuming and dusting to listen to a song of praise from the pulpit of New Salem Baptist Church in Tams. “I feel good, good, good down in my soul,” sings Queen Schoolfield, born and raised in Tams and a member of church ever since she was a little girl. Back in those days, New Salem was full to brimming every Sunday. So was Tams. Now, the congregation has dwindled to about a dozen regulars, and the church is the only building left standing in the abandoned coal camp. But community members hope to breathe new life into this spot as a cultural heritage site. Backing Schoolfield up in the choir are volunteers of all ages who are participating in the yearly Martin Luther King Jr. Day of Service. On Monday, the Appalachian Coal Country Team worked alongside the Rural Appalachian Improvement League’s (RAIL) youth program to clean up the church, and an African American cemetery up the road. As he videotaped the performance, Dewey Houck, president of RAIL, said, “Coalfield history is important to us, and this is definitely a part of it.” When the hymns are over, it’s back to work. Wobbling on a ladder, a group of young people struggled to dismantle a ceiling light and rid it of dead insects. “I’m so happy they’re cleaning those lights,” said Schoolfield. “Thank the Lord.” There’s no question that New Salem is in need of some TLC, but it has obviously been well-loved by generations of congregants. Built in 1922, it served the black community of Tams through the heyday of coal mining in the Winding Gulf Coalfield of Raleigh County. Flanked by old portraits of its earliest pastors, its pulpit rises slightly above dozens of peach-colored pews. The late morning winter sunshine streams through its antique rolled glass windows, shaped in gothic arches. It strikes on old hymnals, fans printed with images of a black Jesus and plaques honoring congregants who have passed away. “In Loving Memory of Ivory Wiley Lavender,” reads one. “She was like Queenie. If you got around her, you got a blessing,” said Tom Cox of Stotesbury, a town right up the road. Cox is one of the leaders in the effort to restore historic structures along the Coal Heritage Trail and present them to visitors. As a boy, he sold loads of coal to area households, getting to know quite a few people in the Winding Gulf in the process. “This is the life of a coal camp, the church,” he said. “When we were kids, life revolved around the church, and that lifestyle is drying up. If we don’t save these structures, there’s a way of life that’s leaving here.” Like many of the coal towns around it, Tams has a rich history that lives on mostly in memory and a few photographs, since its abandonment in the mid-1980s. Founded in 1909 by the coal baron W.P. Tams, owner of The Gulf Smokeless Coal Co., its segregated neighborhoods included Upper Tams for African Americans and Hunk Hill for the foreign-born. Every house was painted white with green trim. “People often think West Virginia is an ethnically homogenous place, and this is one of the last physical relics in the Winding Gulf that is proof that that story isn’t entirely true,” said Jack Seitz, volunteer field coordinator for the Appalachian Coal Country Team. “I think it’s neat and important that it challenges that stereotype.” New Salem was one of two black churches in town; the three white churches were Baptist, Methodist and Catholic. After a 10-year community effort, New Salem will finally get a new roof this spring. There are plans to repaint as well. But it still needs running water, and even paying utility bills is a struggle. For years, Schoolfield has sold hot dogs and baked goods on the street in Beckley to keep the building heated. RAIL has a vision to turn places like New Salem Baptist Church into a basis for cultural tourism in southern West Virginia. They’d like to see the church on the National Register of Historic Places. They hope to restore the church at Wyco as a repository for coalfields history. They want to catalog and record coal camp culture by those who lived it. They see the Winding Gulf and its relics as a “Gateway to the Southern West Virginia Coalfields” on the Coal Heritage Trail. The trail includes 187 miles of “scenic industrial heritage” through a five-county region that reflects a “legacy of working-class culture, industrial might, racial and ethnic diversity,” according to trail promoters. “We’ve got to protect and restore our heritage to build a new economy,” said Seitz. ATV trails from nearby Burning Rock Off Road Park wind right past New Salem. That’s one market to be tapped, said Houck. Another are the people who left the coalfields when the industry went bust. “You’d be surprised the number of people in the summer who return here. They show up in my driveway looking for help finding this or that,” said Cox. “They are a part of our history and if we’re going to attract visitors to our community to see what it was like 50 years ago at the height of the coal boom, then we’ve got to preserve these churches,” said Houck. But the group says it needs more support to make it work, whether in the form of cash donations or additional volunteer organizers. They want to create the Coal Heritage Trail Coalition of Volunteers for Community Enrichment to see the organization’s goals through to completion. But on Martin Luther King Jr. Day of Service, they had hands enough at least to spiff up New Salem and also clean up the abandoned St. Johns Church cemetery for the African American coal camp at Stotesbury. Those buried at St. Johns include black veterans from World War I. At least one served with the 803 Pioneer Infantry Battalion, as reflected on a gravestone. Local residents want to preserve the foundation and corner stone of the church; put up a memorial to African American miners; and dedicate the cemetery to WWI African American veterans. Daniels resident Glenda Apple showed up in Tams to volunteer after searching for a nearby project on the Day of Service’s official website. “When I saw what the project was, I thought it was very important for the area. I really think it’s worthwhile,” she said. Right away, Houck began recruiting her to become more deeply involved in the preservation work his organization wants to accomplish. Meanwhile, Tyler Stafford, a student at Wyoming County East High School, did janitorial duty in the church sanctuary. Stafford is a part of the West Virginia Coalfields Communities Youth Corps, RAIL’s youth program for high school students. They work 18 hours a week after school on various community development projects. They get a paycheck, experience and mentorship. “I’ve met a lot of people and made new friends,” said Stafford. “It’s fun.” The youth program’s director, Charlene Cook, said it teaches students a work ethic that will come in handy later. “Your future wives will thank me,” she told two teenage boys running a sweeper in the church basement. One room over, Schoolfield heats up water for cleaning. One day she hopes for a water hookup at the church, but for now she uses jugs that were purchased and hauled in. “I feel like a million dollars,” she says. For more information on the Rural Appalachian Improvement League’s efforts to restore relics at Tams, Stotesbury and other coalfield towns, visit www.railwv.org, send an e-mail to mullinsproject@aol.com, or call 304-294-6188. This summer, the Wyoming County Council On Aging will move from the Itmann location to the former Big Lots building in Mullens. The current facility, located in the former school building in Itmann, has been flooded multiple times and has sustained structural damage, Gibson explained. “The corner is starting to crumble,” she said. Engineers are checking the structure about every six months, so it is still safe for the time being, Gibson noted. The Council On Aging purchased the supermarket portion of the Mullens building in addition to the adjoining three acres with state grant funding and some monies from the council, she said. An architect has been hired to plan the new facility. “This building has 15,000 square feet,” Gibson said of the new location. “With the (additional property) we can expand if we need to. “With The Way next door, it will be a multi-generational site,” she emphasized. The Way is a community youth center. On Jan. 19, the President’s Day of National Service, several volunteers were helping to ready the building for the new occupants. Among the New Coalition of Volunteers were the Rural Appalachian Improvement League and the Mullens Opportunity Center’s Coalfields Communities Youth Corps, a group of at risk youngsters, under the direction of Charlene Cook and Dewey Houck, among other groups. “We are building an outstanding program for at risk youth, ages 14 to 21, at the MOC,” Houck said. “We are very proud of these kids and want to expose them to as much of the social environment as possible. 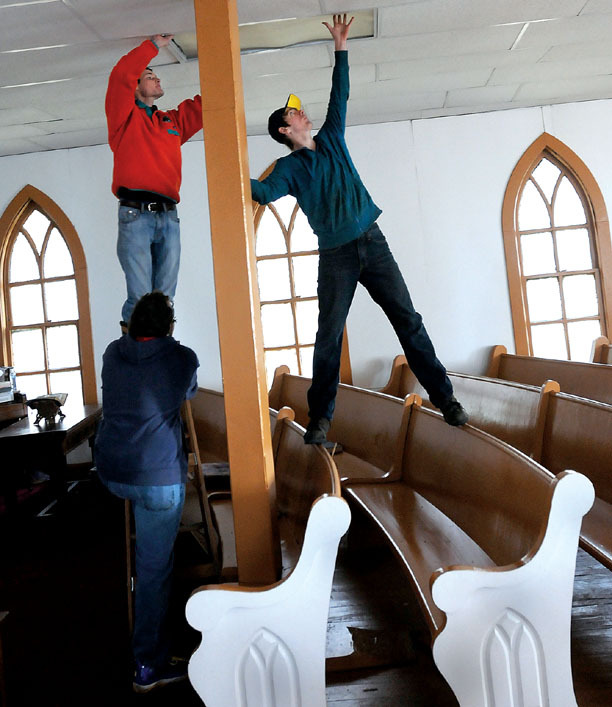 The volunteers were moving church pews that had been stored there while the historic Wyco Church is being restored. “The first thing we’ll have to do is put on a new roof,” Gibson said as the volunteers moved the items from the frigid building. She lauded the assistance of state Sens. Mike Green and Daniel Hall, Del. Linda Goode Phillips, and former Sen. Richard Browning in obtaining funding for the project. “We’ll still be doing some fundraising,” Gibson said. Additionally, volunteers will be working at the new site Saturday mornings to get ready for the move, she noted. All volunteers and organizations are welcome to participate. The Wyoming County Council On Aging serves about 800 seniors a day, according to Gibson, through the center, Meals On Wheels, transportation, and in-home care programs. The council’s meals program provides lunch in the center or home delivery, she said. Transportation is also provided, through a center program, for seniors and the disabled to local doctor’s appointments, pharmacies, and shopping. Additionally, the van will provide transportation to the center, she said. While the services are free, donations are accepted for the meals and transportation programs, she noted. The Council on Aging also provides in-home personal care services for those in need. Eligibility guidelines can be explained by staff members. The Itmann center is open Monday-Friday from 8 a.m. until 4 p.m.; phone 304-294-8800 for more information concerning available services. The New Coalition Of Volunteers, as it exists today, Houck noted, is made up of volunteers from the Appalachian Coal Country Team, Rural Appalachian Improvement League, Wyoming County Diabetes Coalition, Appalachia Energy and Environment Partnership, Friends of the Appalachian Coal Country Team, Stotesbury Historical and Preservation Committee, Wyco Historical and Preservation Committee, Coalfields Communities Youth Corps, and others. “The coalition is organized to provide a network of volunteers to maximize efforts performing community and economic development in the coalfields,” Houck explained. “The coalition welcomes all that are interested in volunteering on projects that improves life-quality for families living in the Appalachian coalfields that have a tangible measurable outcome,” he said. From the first settler in what is now Oceana to the railroad boom in Mullens, museums across Wyoming County are showcasing the origins of civilization, industry, and life through the centuries. In Mullens, an AmeriCorps NCCC (National Civilian Community Corps) team, working with several local volunteers, completed painting the Jack Feller Coalfields History and Culture Information Center, or Feller Heritage Center, earlier this year. The mini-museum houses exhibits focusing on the area’s railroading, coal mining, and timbering histories, along with other Appalachian legacies, according to Dewey Houck, president of Rural Appalachian Improvement League (RAIL), which operates the center. The structure is a replica of the Virginian Railway telegraph office, located in Ellett, Va., that controlled eastbound movement of trains through the mile-long Allegheny Tunnel, Houck explained. Feller has written a series of books on the history of Mullens and is a Virginian Railroad enthusiast responsible for coordinating annual local tours for visiting railroad devotees, Houck said. Feller was honored during ceremonies last fall at the Mullens Opportunity Center, where the mini museum is located. W. H. “Bill” Wade donated the telegraph key used at the Mullens railroad station, Houck said. The telegraph will be a central part of the museum exhibits. “In the early days of railroading, trains relied on the telegraph to keep up with trains moving from place to place,” Houck explained. “The mini museum will be furnished as an early telegraph office and flag stop for passengers to get on or off trains. “Mullens sprang up as a railroading, coal mining, and timbering center of commerce — supporting almost two dozen coal camps, a lumber mill town, and other small communities,” Houck noted. “Many of these sites have some remainder of history that can be pointed out and many have substantial evidence of a once thriving commercial base,” Houck said. “Sponsors of the initiative envision the facility as a first stop for tourists exiting the Coalfields Expressway in Mullens who desire to visit local sites of interests or purchase local crafts or specialty agricultural products. “When the Coalfields Expressway gets to Mullens, we want to be in some kind of condition to welcome people onto the Coal Heritage Trail,” Houck said of the center. “The building (will) contain one large room, with half containing a replica of a mid-20th century railroad telegraph office,” Houck added. The remainder of the structure will contain photographs and other displays. The Wyoming County Historical Museum opened in 2010 in the bottom portion of Oceana’s former town hall building. One year later, the museum was expanded into the upper level and is running out of room for the number of historical items people want to display, explained Betsy Ross, museum board treasurer. The centerpiece of the museum is John Cooke’s rifle, which has been loaned to the museum by Mildred Shannon, widow of U.J. Shannon, a direct descendent of Cooke. John Cooke is the first known permanent settler of Wyoming County. He built his cabin at the mouth of Laurel Fork, in what is today Oceana, in the late 1790s, according to historians. His gun is believed to have been constructed in the 1700s as well. Cooke fought in the Revolutionary War and fought against the Indians as a soldier, according to historians. Additionally, prior to his death, historian Paul Ray Blankenship provided a brick, made by slaves on the McDonald Plantation, to the museum. Capt. Edward McDonald is believed to be the third permanent settler of Wyoming County, in 1802. McDonald was the first to bring slaves into Wyoming County. The 7,000-acre farm included barns, tool sheds, tobacco shelters, a blacksmith shop, a gristmill, among other structures. “Some structures were made, at least partially, of pressed clay brick, so such facilities were also available on the plantation,” Blankenship said when he presented the item for exhibit. The brick was discovered in the 1970s during some excavation near the location of the McDonald gristmill. The area today is known as Crouch’s Farm. In addition to the various exhibits, the museum also serves as an information center for the two Civil War Trails markers, located near Oceana, depicting two historic Civil War incidents that occurred in Wyoming County. The museum’s board of directors is also working to organize the second annual Civil War Days reenactment, scheduled next spring, according to Ross. Providing the living history demonstrations was the brainchild of Jesse Womack, the first museum board president. Other smaller museums are also being planned in other areas of the county, depending on available funding, according to officials. Mullens’ year-long centennial celebration will continue with the annual farm parade Saturday, Sept. 29, at noon. U.S. Rep. Nick Rahall, D-W.Va., will serve as grand marshal. Tractors, along with horses and wagons, will be featured during the popular event. Prizes will be awarded to the three best parade participants, according to organizers. The parade coincides with Gov. Earl Tomblin’s Day to Serve, according to Dewey Houck, director of Rural Appalachian Improvement League (RAIL). A weekend of service and celebration have been planned, Houck said. Two AmeriCorps NCCC teams will arrive Friday, Sept. 28, “to assist local volunteers in building their community into a destination for travelers and guests who desire to come and enjoy the mountains and pleasing culture,” Houck said. 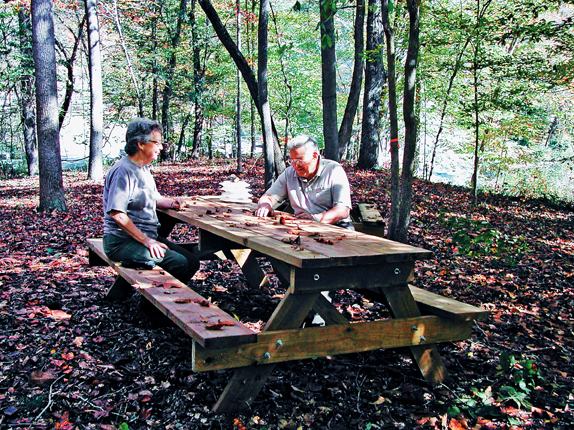 The Mullens Opportunity Center is the site for 10 RV/camper sites and 15 primitive camp sites. “All the labor is being provided by volunteers and AmeriCorps,” Houck said. “This will be the eighth time NCCC has visited Mullens to help with community and economic development projects. “Previous NCCC teams have assisted in building a full size outdoor theater in a setting that will accommodate over 1,000 people,” Houck noted. “They also assisted in establishing Tater Hill Park and trail system, complete with a pavilion and overlook. “Additionally, NCCC assisted in constructing a replica of a railroad remote telegraph office that serves as a mini museum/information center,” Houck said. On Saturday, the work day will begin at 8 a.m., then participants will join in the parade. Following the parade, prizes will be awarded, at the outdoor theater, for best in parade along with best dressed male and best dressed female in farmer outfits. A cornbread and beans dinner will be served from 3 until 5 p.m. followed by a gospel sing beginning at 5 p.m.
On Sunday, Cheat River Band will perform beginning at 3 p.m.
Houck lauded volunteers Jimmy and Iris Manning, Dee and Ronnie Lusk, and Karen Bowers for their hard work in organizing the parade. “Having volunteers take on projects, such as this, is very good for community building; that is so necessary in building a new economy,” Houck emphasized. Ten RV/camper sites were completed Aug. 10-13 at the Mullens Opportunity Center, according to Dewey Houck, president of the Rural Appalachian Improvement League (RAIL) which operates the center. The group’s 11th AmeriCorps NCCC (National Civilian Community Corps) team worked with several local volunteers to construct the sites, clear the banks of the adjacent Guyandotte River for picnic tables, and to paint the Jack Feller Coalfields History and Culture Information Center. The sites will serve ATV riders and other visitors, Houck said. The project was funded through a state grant and much of the materials donated by Gordan Brooks, who grew up in Mullens and now owns an electrical services company in Roanoke, Va.
Jack Feller was about three years old when his family moved to Mullens from Raleigh County. The 13-year-old city was bustling with money from the timber, coal and railroad industries. Feller’s father, C.V. Feller, for whom the family-owned business is still named, moved his insurance business to Mullens. “It’s probably the oldest family-owned business in Wyoming County,” Feller said of his family’s insurance business. Though he is retired, both his sons — Charles and Steve — now operate the business in Mullens and Oceana. “They had just put in the streets, the water lines, and the sewer,” Feller said of his family’s move to Mullens. In a sense, the city and Feller grew up together. The city was incorporated in 1912; Feller was born in 1922 and moved to Mullens in 1925. About the same time, Mullens had three banks, Feller recalls. Two of the banks failed in the mid-1920s. “The depression hit in Mullens before it hit the rest of the nation,” Feller said. A.J. Mullins, city founder, and a few others bought one of the banks and created the Peoples Bank of Mullens, which today is First Peoples Bank. Feller said there was a push to make Mullens the county seat of Wyoming County and Ben Dunham, a prominent citizen, would donate the land for the courthouse. Of course that plan fell through and the land went to the site for what became Ben Dunham Elementary School, then later a high school, Feller said. Feller did a series of five books on the history of Mullens, through 1946. He began the series in an effort to put his father’s large collection of photos and other memorabilia into some type of order. He also began talking with people in his own age group and added to his own vast collection. Then, he researched old newspaper articles along with high school newspapers and yearbooks to add to the collection. The books are now sold out and much of Feller’s collection was lost in the July 8, 2001, flood in Mullens. The Jack Feller Coalfields History and Culture Information Center, or more briefly the Feller Heritage Center, is expected to open later this fall at the Mullens Opportunity Center. The mini museum will house items from the area’s railroad, coal, timber, and other Appalachian legacies, according to Dewey Houck, director of Rural Appalachian Improvement League (RAIL), which is coordinating the project. The structure is a replica of the Virginian Railway telegraph office, located in Ellett, Va., that controlled eastbound movement of trains through the mile-long Allegheny Tunnel. While Feller’s love of Mullens’ history continues, he maintains someone else will have to pick up the gauntlet from 1946 to the present. Rural Appalachian Improvement League (RAIL) will have 10 work teams this year, according to Dewey Houck, director. One of the most recent was an eight-member team from the Unitarian Universalist Fellowship Church of Centre County, Pa. The trip was arranged by Laura Brown, a senior undergraduate studies adviser at Penn State University, Houck said. Unitarian team members must earn the money to participate in a mission trip, Houck explained, adding this group brought $1,500 to purchase materials. They sponsored a dinner and washed windows to raise the funds, Houck noted. “They raise sufficient funds to pay for all the materials they use on a project,” he said. In addition to working on the historic Wyco church, the group has assisted with work on three Mullens area houses, according to Ken Riznyk, a retired psychologist who worked for the state of Pennsylvania. Additionally, the volunteers hauled off roofing shingles for an 88-year-old who had replaced his own roof but had no way to dispose of the old shingles. One of the handicaps of working in the area is the lack of ready supplies, Riznyk said. Riznyk has spent previous vacations in Puerto Rico and New Orleans helping to rehab housing in the wake of Hurricane Katrina. “I’ve had a comfortable life,” Riznyk said, adding he wanted to help people who need it. The four women in the group spent most of their time at the church, painting the newly-installed siding and other work, Houck said. Built in 1917, the Wyco Independent Baptist Church was built for the community’s white miners and their families during the 20th century coal boom, when segregation was a way of life. Now owned by RAIL, the church hasn’t been used for services since the early 1980s. The church was named to the Preservation Alliance of West Virginia’s 2009 endangered properties list, and, in 2010, was named to the National Register of Historic Places. Houck wants to restore the structure to its original grace and has been working to garner funding and volunteer labor. He hopes to house a coal camp museum inside the restored church, complete with audio recordings of the area’s history now being made across the southern coalfields. He hopes to return the church to a community resource, as well as a place where visitors can meditate. Restoration is being completed in phases, Houck notes. A new road to the church has been constructed and a bridge over Allen Creek was built to create a path to the church. Improvements to the church thus far will be showcased during a public event in July, Houck said. Both Kayley Hanencrat, of Canton, Ohio, and Virginia Burger, of Minnesota, were making return trips. Hanencrat’s parents also came down for the weekend to help plant 40 trees around the Mullens Opportunity Center, according to Dewey Houck, director of Rural Appalachian Improvement League (RAIL). Burger returned for the third time last week. In addition to planting the trees, the students helped clear a Hatfied-McCoy ATV trail near Pineville, painted a bathroom in an area school, cleaned the pavilion in Mullens, among other projects. Under the direction of RAIL, Houck said, more than 130 students from Columbia, Cornell, Illinois State, Michigan Tech, and University of Illinois Chicago will provide more than 4,000 hours of volunteer community service over the course of a month. “The lure of our mountains is drawing young folks from universities during their spring break,” Houck said. “When so many young people choose to spend their time at play, it is encouraging that these students will spend their time assisting with projects in our area. “It gives us hope for the future of the next generation. When so many young people are self-absorbed, it is wonderful to witness this kind of spirit,” he said. Alongside local residents and AmeriCorps VISTA members, the college students will clean vacant storefront windows in Mullens to make space for local art work, help landscape parks and recreation areas, pull debris from streams and do stream bank restoration, assist with restoration of the Mullens Caboose Museum, among numerous other projects, according to Houck. Additionally, the students are working in Stotesbury, hometown of U.S. Sen. Robert C. Byrd, to restore a local cemetery and Mark Twain School, Byrd’s alma mater. “This effort is an attempt to salvage some of the history of the early 20th century coal boom culture,” Houck explained. RAIL was founded by Houck, a Purpose Prize Fellow, who has volunteered for 10 years, utilizing the capacity of AmeriCorps programs and volunteers to build RAIL. “These students are not only accomplishing important tasks that benefit society, but are working to achieve the goals of RAIL and that is to help people help themselves,” Houck emphasized. In the coming weeks, Brooks will return to assist with the installation of motorhome sites at the center. Also pictured are Dewey Houck, Rural Appalachian Improvement League (RAIL) director, and Jim Kosowski, right, of Cliffs Natural Resources, which contributed $2,500 for the new electrical system. Volunteers from Georgia stop for lunch Friday while working to restore the historic Wyco Church. Chainsaw motors and pounding hammers shattered the quiet solitude of the hillside where the 93-year-old church sits overlooking the small coalfield community of Wyco Friday morning. Now owned by Rural Appalachian Improvement League (RAIL) in Mullens, the historic church hasn’t been used for services since the early 1980s and sits in disrepair. Dewey Houck, RAIL director, wants to restore the structure to its original grace and has been working to garner funding and volunteer labor. Houck hopes to house a coal camp museum inside the restored church, complete with audio recordings of the area’s history now being made across the southern coalfields. He hopes to return the church to a community resource, as well as a place where visitors can meditate. The church was named to the Preservation Alliance of West Virginia’s 2009 endangered properties list; then, in March, was named to the National Register of Historic Places, opening the door for “a whole range of funding opportunities,” according to Lynn Stasick, statewide field representative for the Preservation Alliance. Stasick has provided suggestions on what needs to be done to preserve the structure and assisted with getting the church placed on the prestigious lists. The first phase was to clean up the property and prevent further damage from the elements. The deteriorating roof has resulted in significant water damage inside the church. With about $50,000 available in funding, a contractor will be hired to shore up and bring the structure back, Houck explained. Then, volunteers will again step in and complete the work. Houck believes the project will take another year. Volunteers have been the backbone of the work completed over the last couple of years and a group from Atlanta, Ga., was busy during a return trip Friday. They will spend the weekend painting and cleaning. The group cut down trees, cleared away brush,and worked inside the structure Friday. Shirley Farmer Weaver, who grew up in Itmann, along with fellow First Presbyterian Church members from Douglasville, Ga., co-workers from Lockheed Martin in Marietta, Ga., and other friends spent time working at the church last year. Weaver said she and her husband, Charles Weaver, met Houck when they volunteered after the July 2001 flood. “He’s done a lot for southern Wyoming County and this was something we could do for him,” she added. Both her parents as well as her husband’s parents still live in the area, she noted, and they hope to see a community reunion held in the church next year. The Wyco church, however, is not the only church Houck hopes to save. He hopes to save as many old churches along the Coal Heritage Trail as possible. The trail is a nationally designated scenic highway showcasing the area’s coal history. “This church will be the model,” he said. “I hope the rest of them won’t be as difficult as this one. “This is what we have left — our coal culture — to sell to tourists,” Houck emphasized. Shirley Farmer Weaver, along with 16 of her fellow employees at Lockheed Martin in Marietta, Ga., worked at the Wyco Church July 24-26, beginning the demolition phase of the restoration, according to Dewey Houck, executive director of Rural Appalachian Improvement League (RAIL). Wyco Church building is one of eight structures placed on Preservation Alliance of West Virginia’s 2009 Endangered Properties list. RAIL is seeking funding to fully restore the structure and grounds to original condition, Houck noted. “When restored, Wyco Church will become a showcase and museum to depict rural coal boom culture and history,” Houck pledged. “Shirley Weaver, whom I have known and worked with for awhile, approached us with a challenge about four months ago that involved volunteering for a mission opportunity in her hometown of Mullens,” explained David Adams, one of the volunteers from Lockheed. “She explained that it would involve several people from her church in Douglasville (Ga.) and other co-workers from Lockheed to take a trip to the Mullens area which had been devastated by recent floods and neglected during economic turmoil,” he said. “Shirley has family and friends in this part of West Virginia and felt compelled to do something extraordinary,” Adams said. Following several teleconferences with Houck, the Georgia group arrived ready to work on the church which has fallen into dangerous disrepair. “Forty volunteers were prepared to do anything from tearing out ceiling tile to clearing brush, and building an outhouse on the property,” Adams said. Volunteers from Weaver’s church, Douglasville (Ga.) Presbyterian, assisted with repairs to area homes damaged during flooding. “Our Lockheed group from Georgia worked nonstop with the help of some local families that were so kind to feed, lodge and also work by our side for the two days that we were there,” Adams said. Now sitting in disrepair among the encroaching weeds and brush, Wyco Church was built by Wyoming Coal Co. in 1917 for the white miners and their families in the little coal community. The church has been placed on this year’s Preservation Alliance of West Virginia’s endangered properties list, according to Karen Carper, executive director. Coal baron Maj. W.T. Tams built Wyco in 1914, including a coal camp, superintendent’s house and two churches — one for white miners and families, another for African-American miners and their families. That came after he had built Tams coal camp in Raleigh County, according to historians. The second Wyco church, known today as Mount Grove Baptist Church, was built for African-American miners and their families, according to historians. The church is still active today. Sometime in the 1990s, Wyco Church, near Mullens, was abandoned. Since that time, the roof has become compromised and water intrusion has led to ongoing deterioration of the structure, according to Dewey Houck, director of the Rural Appalachian Improvement League. In 2003, ownership of the church was transferred to RAIL. Currently, RAIL is seeking assistance in it efforts to stabilize and eventually restore the historic church. “Our best product is our historic structures,” Houck said. “Some of our buildings are gone; I hated to see that. “Our mission is to clean up the city and create a tourist attraction,” he explained. Walking trails, complete with brochures and markers, have been mapped through Mullens, showcasing the historic structures. New parks and gardens have been created and existing parks improved. Houck hopes to save historic structures in the surrounding areas, such as Wyco, as well. The historic church is part of this year’s diverse endangered properties. “We have a church, a school, two historic hotels, a theater, a bridge, a private home and a historic homeless shelter,” Carper said. Other properties include Hinton’s McCreery Hotel, Capitol Theatre of Wheeling, First Ward School of Elkins, Tyler County Home, Glenville Bridge and the Waldo Hotel of Clarksburg. All properties are listed or eligible for listing on the National Register of Historic Places and meet other criteria such as historic significance, geographic location, preservation emergency and resources available to resolve the endangerment. A $75,000 National Trust for Historic Preservation Partners in the Field challenge grant will support services to these and other endangered West Virginia properties. The grant will fund one new staff person at Preservation Alliance. The field services representative will work to provide on-site assistance to properties, help with redevelopment and sustainability plans and identify funding sources for preservation projects. The possibility of losing this icon of the coal boom has prompted one former Wyoming County resident to take action, according to Dewey Houck, director of Rural Appalachian Improvement League (RAIL), which now owns the structure. Shirley Farmer Weaver, along with 17 of her fellow employees at Lockheed Martin in Marietta, Ga., will begin preparing the structure for major repairs July 24, Houck said. “Weaver, working from her home in Douglasville, Ga., has worked diligently to have everything in place to go to work bright and early on July 24,” Houck said. Major W.T. Tams, a coal baron, built Wyco in 1914, including a coal camp, superintendent’s house, and two churches — one for white miners and families, another for African-American miners and their families. This came after he had built Tams coal camp in Raleigh County, according to historians. The second Wyco church building, known today as the Mount Grove Baptist Church, was constructed for African-American miners and their families, according to historians. The rigid segregation of the Wyco coal camp continued for decades as ownership of the camp changed from Wyoming Coal Company to Amigo Smokeless Coal Company to Blackburn-Patterson Land Company, according to historians. In 1962, the land company gave the Mount Grove Baptist Church to the African-American community, according to historians. The church remains active today. Sometime in the 1990s, the Wyco Church, near Mullens, was abandoned and has fallen into disrepair. “When restored, Wyco Church will become a showcase and museum to depict rural coal boom culture and history,” he pledged. The Wyoming County Commission has provided resources to slow deterioration, according to Houck. Local legislators have also been “very supportive of salvaging Wyco Church as well as other historic landmarks in the coalfields,” Houck said. Weaver, and the residents of Wyco, are encouraging volunteers to join them in beginning the restoration process, Houck emphasized. Interested volunteers are urged to contact Houck at 304-294-6188. Along with the Lockheed Martin work crew, Weaver will accompany 16 volunteers from the Douglasville (Ga.) Presbyterian Church to repair homes damaged as a result of May flooding. All area church congregations, and others interested, are invited to join the volunteers at the Mullens Opportunity Center outdoor stage for worship services beginning at 9 a.m. Sunday, July 26. Those in need of repairs due to the flooding are urged to contact Linda at 304-294-6188. This project will assist in providing approximately 40 Wyoming County youth “an experienced-based curriculum which will improve the lives of youth through work force development, providing greater opportunities in school and life,” according to Dewey Houck, director of RAIL. The students will be selected from schools with 50 percent or more of the student body receiving free or reduced lunches. Junior Achievement of West Virginia and the Advantage Valley Inc. will create a learning laboratory within the classroom using a practical, interactive learning approach, Houck explained. “The support of The Mullens Project is critical to teaching students to focus on the future, with the understanding needed to acquire an applied vision of the work force. Each young achiever is provided the opportunity to explore, think critically, and team build,” Houck said. Representatives from the Houck family, Beckley Area Foundation, Human Resource Development Foundation, RAIL, Wyoming County Board of Education, and other interested Mullens citizens attended a March 24 luncheon at the Mullens Opportunity Center. The next meeting is scheduled Tuesday, April 28, at 6 p.m. at MOC. All interested residents are invited.